is clearly amazed... Oh... That's not what's happening here. So, Fabregas is gone. Nasri is still an Arsenal player, but can't play in this match anyway. 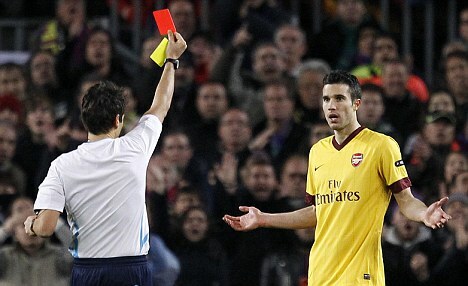 Van Persie serves his ban for having the audacity to take a shot. Arsene Wenger will serve a touchline ban as well. Can the squad situation get any worse for this, one of the more crucial matches of the season? Well, it would appear that Jack Wilshere is still not fit with his ankle problem. Tomas Rosicky faces a fitness test over a groin injury suffered Saturday that I don't remember him picking up. Abou Diaby is sidelined until September after surgery. Predicted XI: Szczesny, Sagna, Vermaelen, Koscielny, Gibbs, Song, Ramsey, Arshavin, Gervinho, Walcott, Chamakh. Udinese may lack the same bite they had last year, after a number of sales over the summer transfer window, but the "Little Zebras" will not be a pushover by any stretch. Chilean international Alexis Sanchez was sold to Barcelona in the summer, while Cristian Zapata was sold to Villarreal and Gokhan Inler was sold to Napoli. However, Udinese still has Antonio Di Natale, a lethal striker who has scored 112 goals in 228 games with the side. He has won the title of "Capocannoniere" as Italy's top goal scorer two years running. On the other end, their goalkeeper, Samir Handanovic, appeared in the 2010 World Cup with Slovenia and tied the Serie A record for penalties saved in a season last year with six. Tottenham, from October 2008. Photo: Guardian. It has been a pretty long time since Arsenal has lost a Champions League match at home, though it probably will not take you very long to remember what that loss was, when you really think about it. Arsenal has not lost a European match at the Emirates over the past two seasons. Arsenal were a perfect 4-0 at the Emirates in the Champions League last season. Two years ago, Arsenal won five of their six Champions League matches at home and came from behind to draw Barcelona in the other. Arsenal's last two Champions League losses at home came against English competition (the previously alluded to 2009 loss against Manchester United and 2004 against Chelsea.) You have to go back to a 3-0 loss to Inter on September 17, 2003 for the last loss at home to a non-English side in European competition. Arsenal did, of course, win that return leg 5-1. This is Udinese's first competitive match of the season. Their last season in Europe came in the UEFA Cup (now Europa League) in 2008/09. They qualified for group play after defeating Borussia Dortmund on penalties. They won Group D with wins over Tottenham Hotspur, Spartak Moscow, and Dinamo Zagreb. They then advanced past Lech Poznan and Zenit St. Petersburg (who had just sold Andrei Arshavin to Arsenal months prior.) Udinese was knocked out by Werder Bremen in the quarter-final. Arsenal have never played Udinese in competition, but the Gunners have played 25 matches against Italian sides, winning 11, losing six, and drawing eight. Arsenal's last match against an Italian team was a 1-0 loss against Roma, which brought the 2009 Round of 16 tie to extra time after Arsenal had won 1-0 at the Emirates. The Gunners won 7-6 on penalties. A year before that, in the same round, Arsenal won dramatically, 2-0, at the San Siro, to beat AC Milan. Udinese have only played one match against English competition, the aforementioned win over Spurs, by a 2-0 scoreline. Spurs at the time were bottom of the table, and after this match, Juande Ramos was sacked. Red cards for everyone! Photo: Guardian. The referee will be Kevin Blom from Holland. Blom took charge of two Champions League matches last year, including one in Arsenal's group (a 3-0 Shakhtar Donetsk win over Braga) and Spartak Moscow's 2-1 win at Zilina. He also took charge of three Europa League matches and two Euro 2012 qualifiers last season. Blom worked a 2009 Europa League match that also saw an Italian side play a team from London. In this match, between AS Roma and Fulham, the Cottagers took a 1-0 lead from the penalty spot into halftime, then had two players sent off in the second half, as Roma came from behind to win 2-1 at Stadio Olimpico. Fulham did win their next two group matches to qualify for the knockout phase and eventually went to the final, where they lost to Atletico Madrid at the very end of extra time. This week, ten more teams will join the 22 who automatically qualified for the 2011/12 Champions League group stage. Five will join from the path for teams that did not win their domestic league (the non-champions, or league route, as it were) and five will join from the champions route. Five first legs will be played today, five more will be played tomorrow. Ties started today will be completed next Wednesday, those starting tomorrow finish next Tuesday. The other four matches today will see Copenhagen host Czech side Viktoria Plzen, Belarusian champion BATE Borisov hosts Austrian side Sturm Graz (whom Arsenal played in a friendly last summer,) Dutch side FC Twente hosts Benfica, and Lyon hosts Rubin Kazan.